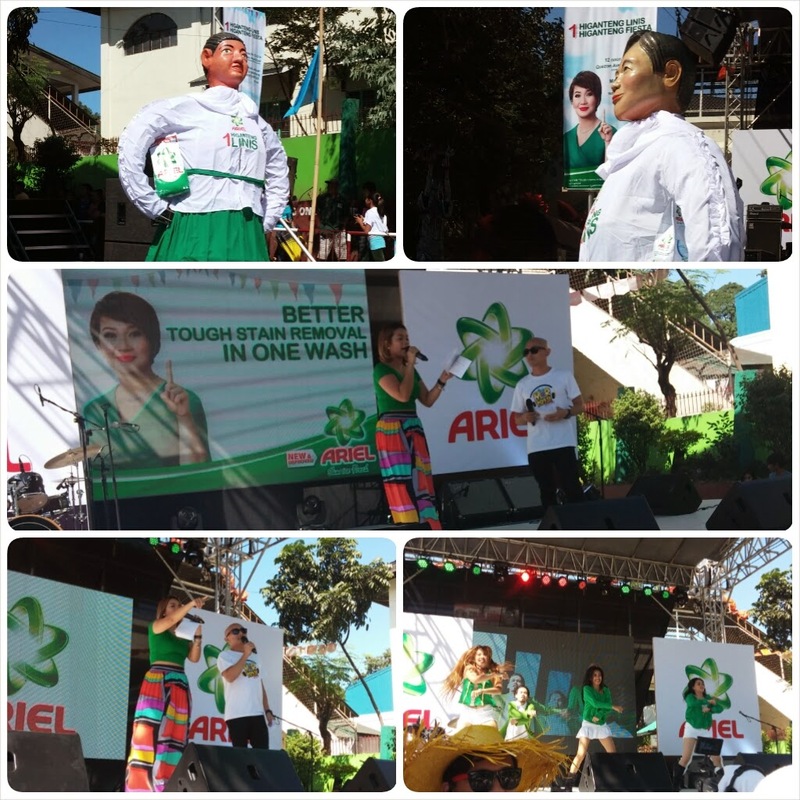 I was one of those lucky people who got invited to witness one great day for ARIEL, a leading detergent powder brand here in the Philippines. What is the event about? Let me tell you what happened on this very adventurous day. 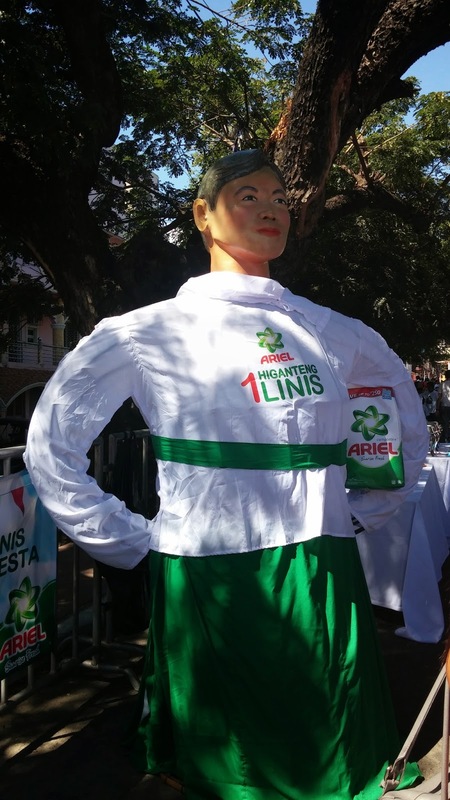 ARIEL launched a campaign in cooperation with the upcoming festivity in Angono, Rizal which is the Higantes Festival, thus the event title, "ARIEL Higanteng Linis Higanteng Fiesta". 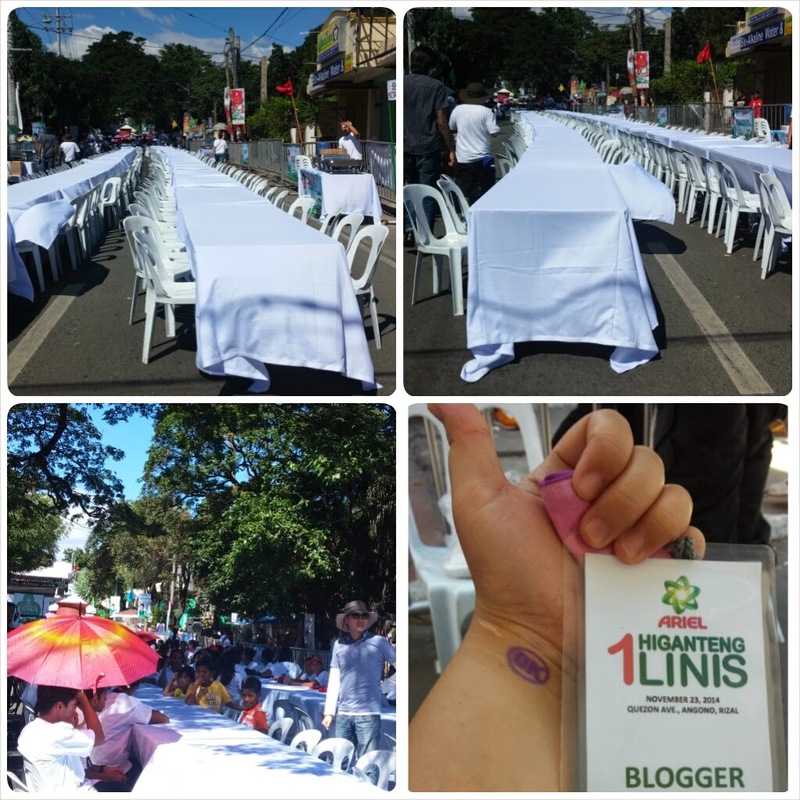 ARIEL prepared a sumptuous free lunch for 1,000 people who would register on that day. Upon arrival, I already saw the stage set-up and the super long lines of tables covered with very clean and white table linens, at the entrance area, people were starting to line up for registration despite the scorching heat of the sun and mind you, it was a Pacquiao fight day, so most probably everyone who was there were excited to partake on a free lunch, plus free Ariel shirts, loads of fun, neighbor bonding and the free concert by Rocksteddy that will happen in the afternoon, not bad in exchange for a big fight right? Right! While the sun gets ready to set, comes one of the highlights of that afternoon, may I quote one mom who asked me during lunch time "Miss ano'ng oras yung rak-rakrakan?" (The mother is a rakista! Rock-on!) I wanted to look for her and let her know "Nanay, rak-rakan naaaaa!" 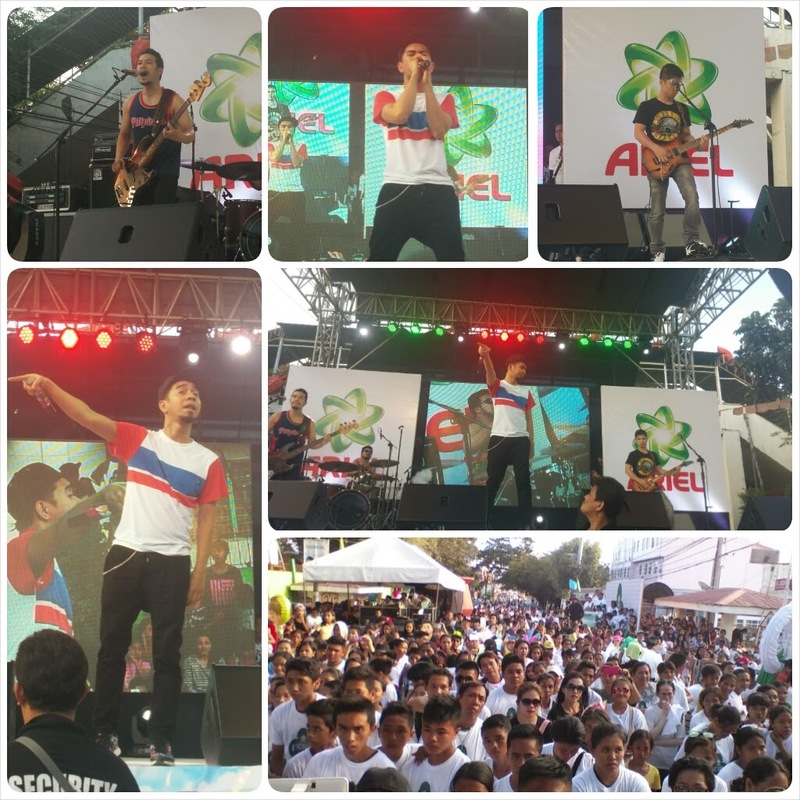 The crowd went wild and excited as Teddy the lead vocalist of the band Rocksteddy started to sing, he even sang the theme song for "It's Showtime!" wherein he is one of the co-host of the noontime show, it didn't surprise me that the people with all their energy sang the song too, yeah we were all singing and it was so much fun! But of course, some good events must come to an end, after the band, it was time to close the event. 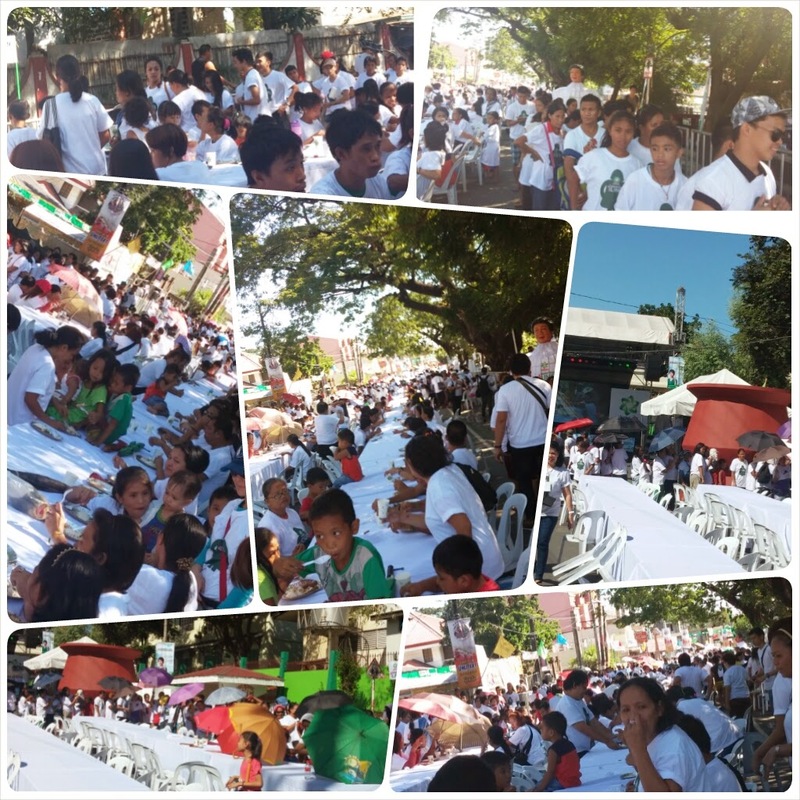 For the people of Angono, with the look on their faces, I knew they had a wonderful time and will have this memory in their hearts and ARIEL on their grocery list (wink). 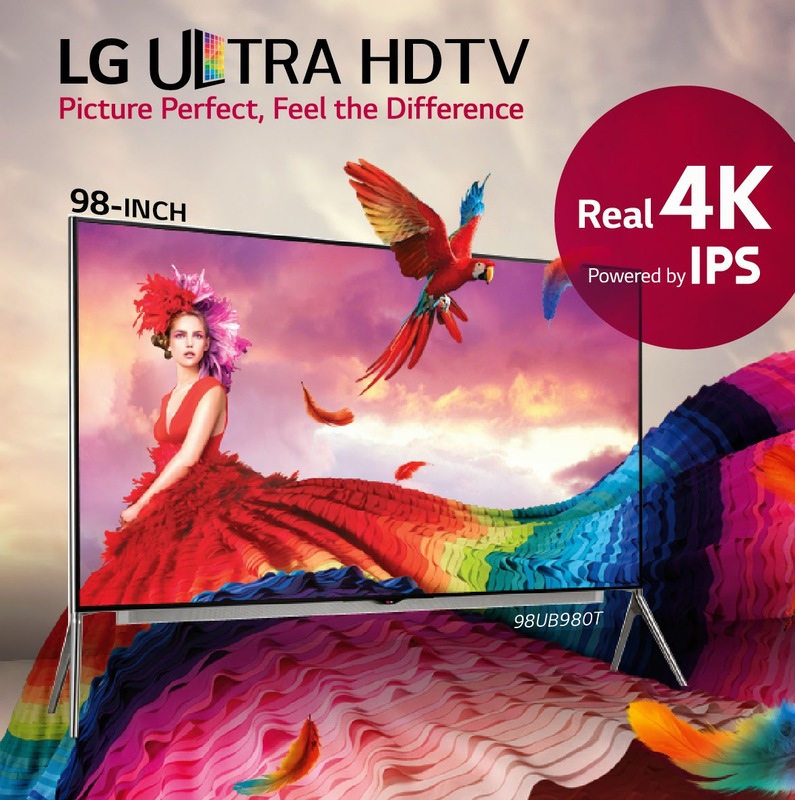 Amplify your family’s enjoyment this Christmas with the biggest gift you can possibly give them this season – the 98-inch Ultra HD television, the newest addition to global technology innovator LG Electronics’ premium TV series and the largest Ultra High-Definition TV size to ever enter the Philippine market this year. Home entertainment has never been this close to the real thing with LG’s 98-inch UHD TV. The gigantic screen not only gives an overwhelming cinematic experience that fills your entire line of vision with immersive action, but also wows with clarity and vivid colors with its 4K 3D+ resolution raising the viewing bar to its highest ever. The future of digital picture, 4K 3D+ attains a resolution four times that of Full HD, with stunning 8.3 million pixels for flawless picture and incredibly vivid detail. What’s more, with its quadrupled resolution, the 3D images are more splendid and lifelike than ever. Furthermore, the IPS 4K Panel, the preferred panel by industries that require razor-sharp precision such as the broadcasting or medical sectors, produces breathtakingly real color on 4K resolution, which remains most consistent in color and contrast from every seat in the house. The giant UHD TV is also complemented by what’s big in sound – a 5.2ch 120W Sliding Speakers. Designed by harmon / kardon, the leading audio solution in the industry, the speaker system boasts of a highly refined sound, providing premium audio to complete your picture-perfect viewing experience. It is also more aesthetically pleasing and space-saving as it removes the need for bulky speakers or wires. ULTRA Surround also engulfs viewers with multi-channel surround sound from seven different directions from top to bottom, left and right, front and center. LG UHD TV’s webOS feature also allows access to live TV programs, VOD, 3D content, apps, recommended content – all from the LG Store, the one-stop location for all your available entertainment. A launcher located at the bottom of the home screen also lets you pick out contents and functions and allows you to switch back and forth between broadcasted programs and choice content. The Smart TV is also complemented by a smart remote – just point and click, scroll up and down, zoom in and out with a wheel just like a computer mouse, and use your voice to ask the remote to find what you want. The 98-inch LG Ultra HD TV will be available in authorized LG dealers nationwide around December 2014. The 105-inch LG Ultra HD TV will soon be entering the Philippine market as well. To learn more about LG’s Ultra HD TV, visit www.lg.com/ph, www.lgblog.com.ph, or www.LGnewsroom.com; like LG’s official Facebook page “LG Philippines”; or follow @LG Philippines on Twitter and Instagram. We were invited for an afternoon of Desserts in a Chinese Restaurant, funny thing I thought that the Resto is hosting the event because they wanted to feature their desserts but I was wrong. 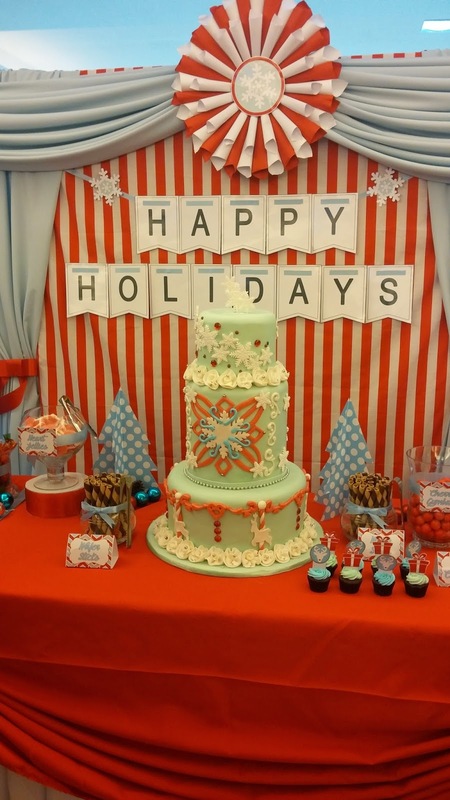 When I came inside the function room, I felt the joy of a little girl when I saw the candy buffet, a teenager who can just dig-in to any cake on the other end of the table (there were like 3 cakes waiting), and wanted to be a bride once more upon glancing at their designed layered cake. Mixed emotions plus for those of you who knows me, well I love pink so the set up was almost everything pink... I am in pink heaven. Drooling now? 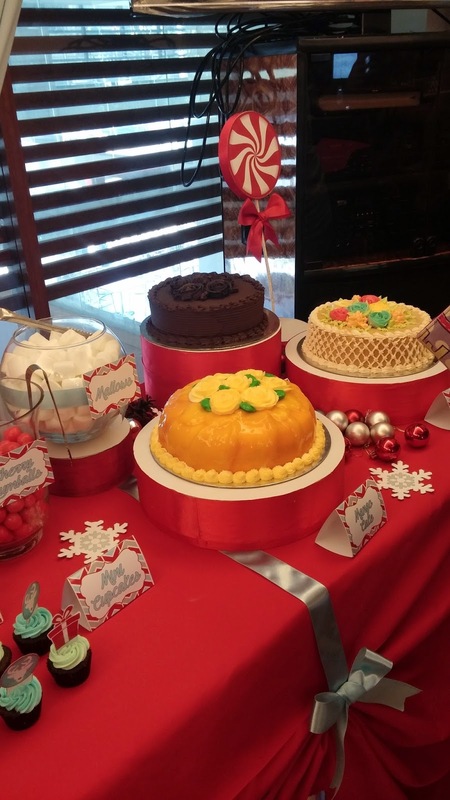 All of these were prepared by Hearts And Bells, a cake company which started just at home and now has been gaining a lot of customers plus they will soon open their shop infront of Lucky China Town Mall in Manila. What interest me the most was they can do a sketch for your cake, you know when you have those many things and designs goiung through your mind but just can't imagine how it would look like, Hearts And Bells can help you with that. How I wish my I knew them before my wedding, I would definitely avail of their services and our wedding cake would have been personalized for us as a couple (10th wedding anniversary-noted!). 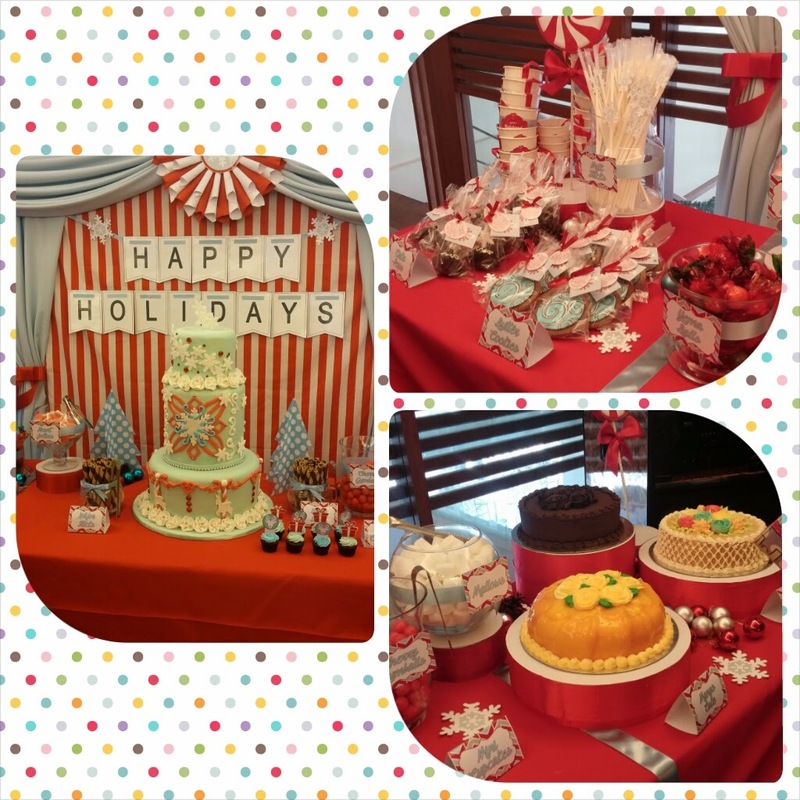 Aside from the fabulous cake designs, they now cater to candy buffets, this is good especially when your guests have to wait for a while, they can munch on them. 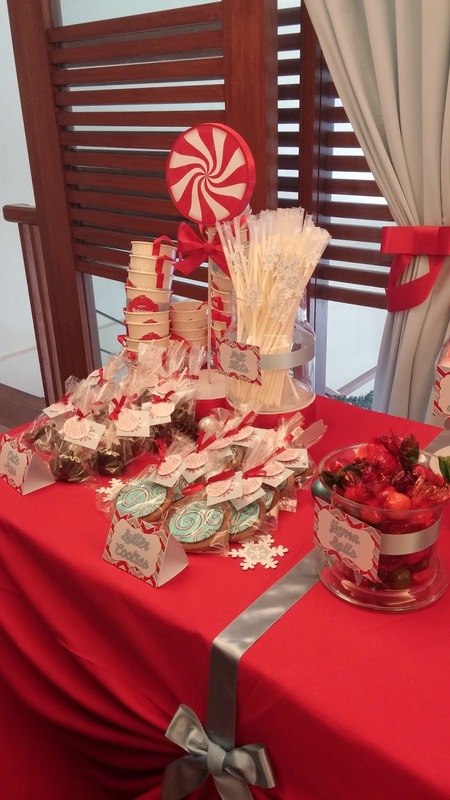 This can also be great for Children's Parties, for sure, the party will be a blast and full of energy (sugar rushing!) Plus kids really loves sweets right? Anyway, the moment we've silently been waiting for was the taste test woohoo! Oh before that, I posted on my facebook that I was having this event with Hearts And Bells and immediately one of my friends said that they were her supplier during her wedding and that their red velvet was super yummy. So, going back to the tasting made me more excited because of that comment, too bad there was no red velvet cake, but they had mango, mocha and chocolate. The Mango Cake was perfect in a way that the sweetness and sourness of the mangoes made the cake's flavor play with my taste buds, every bite is different. The Mocha Cake tastes like mocha, of course it should, not like other mocha flavored cakes I tried, gave me like a close call for diabetis lol! And down to the best moist Chocolate Cake I tried to date, not too sweet and will make you want more, that is how my cake should be. Now craving to have some cake? Order yours now! Be asured that your cake is created to perfection both on the design and taste. Visit their facebook page for details facebook.com/HeartsAndBells for all your sweet needs! 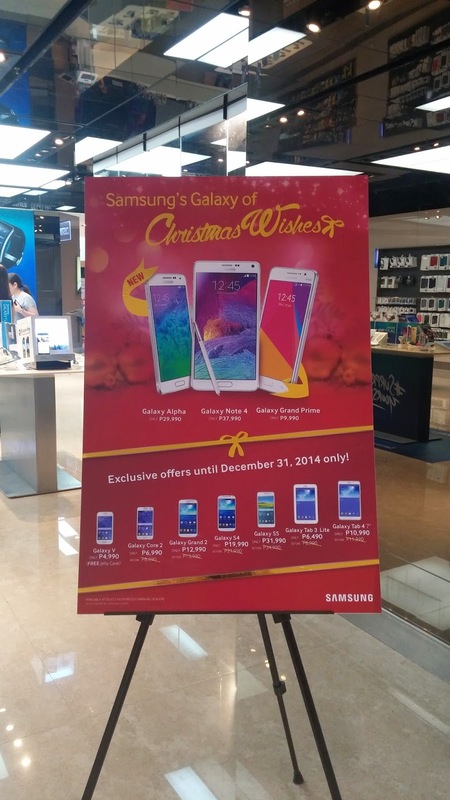 Samsung announces their newest Christmas Sale! Be one of the owners of the latest Samsung gadgets or you can surprise your loved ones with it, but for a lower price. Check out Samsung Experience Stores and partner dealers for this amazing offer. Go get yours now! This offer is until December 31, 2014 only so hurry! It’s a scene typically played out during fiestas: People rushing to the streets, drawn to the sound of a marching band. Everyone is smiling, eager to see the “star” of the celebration. But instead of showing the face of a movie celebrity, a beauty queen or a politician, the video reveals an unlikely, yet welcome sight—a new, clean toilet facility. Aptly titled “Fiesta”, the Domex video, produced by Unilever Philippines, is available on Youtube and shows how underprivileged Filipinos welcome the “arrival” of clean toilet facilities in their communities. “The video aims to make people realize the value of a toilet which most of us, unfortunately, take for granted,” said Dennis Chua, Domex Brand Manager. 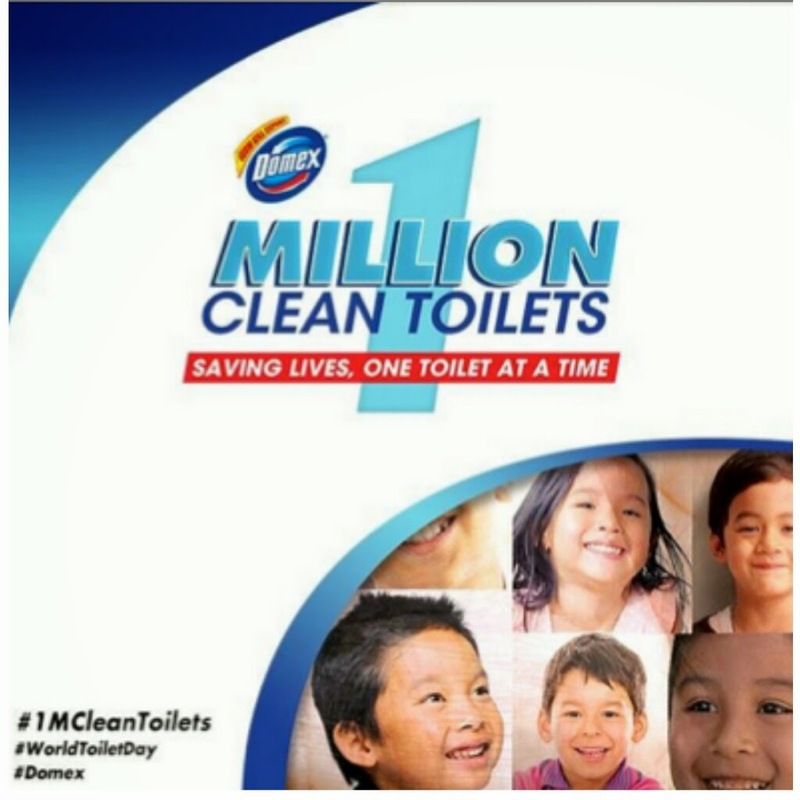 The “Fiesta” video contributes to the efforts of Domex’s One Million Clean Toilets Movement. Each unique view translates into a pledge for the advocacy campaign which collects pledges from households to conscientiously maintain their own hygienic bathrooms. For every pledge received, Domex will donate P5 to UNICEF’s sanitation program, towards improving access to basic sanitation in deprived areas around the world, including the Philippines. “By watching the ‘Fiesta’ video and asking our friends to watch it, we are not only raising awareness for toilet appreciation and sanitation, more importantly, we are helping less privileged communities gain access to clean toilet facilities,” said Benjie Yap, Unilever Foods and Home Care Vice President. All over the country, people are welcoming the construction of new toilet facilities and the repair of dilapidated ones, since becoming aware of its role in disease prevention, especially among children. According to the Department of Health, of the estimated 3,420 diarrhea-related deaths among Filipino children under 5 every year, around 2,000 could have been prevented by access to safe water, improved toilet sanitation and personal hygiene. “This video should serve as a wake-up call for most of us. The little things we take for granted, like having a clean toilet, could mean the world to others and could definitely help save lives,” Chua said. 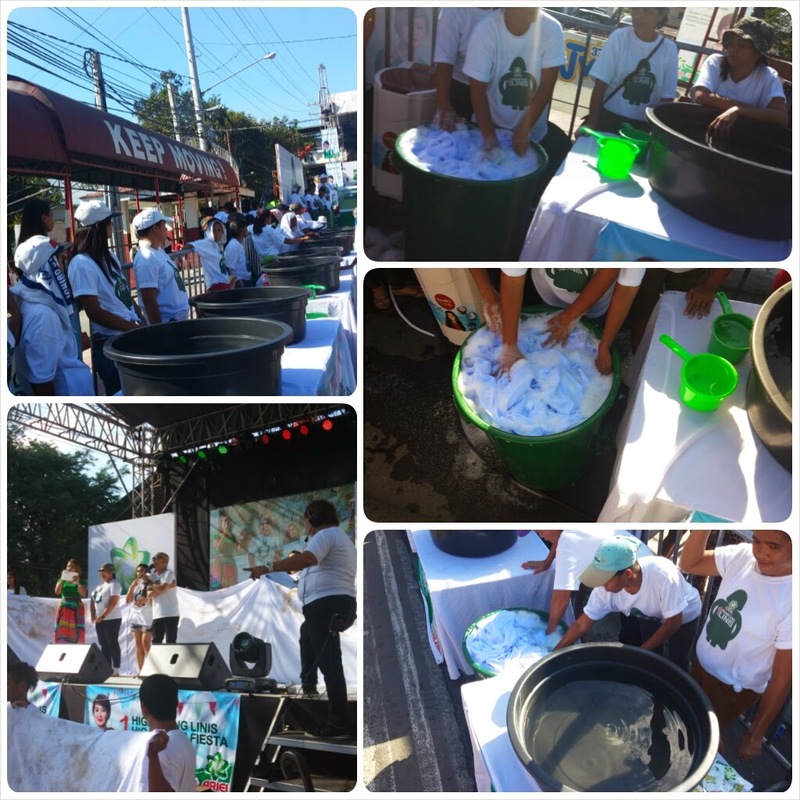 Domex Fiesta for 100 Million Clean Toilets! 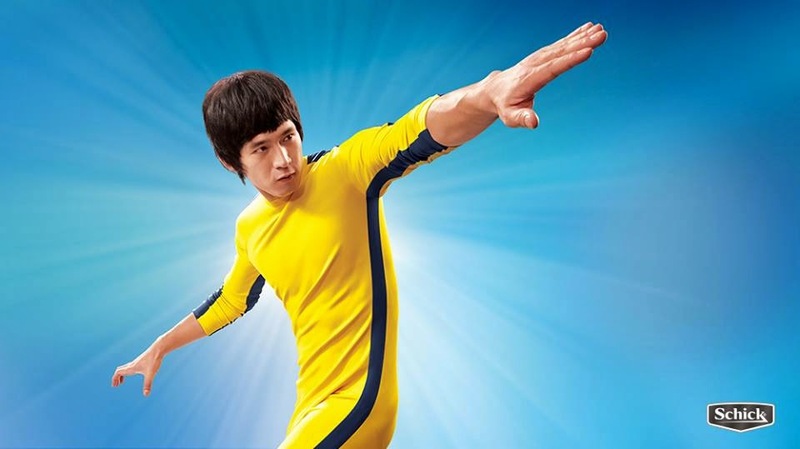 Missed the Smooth Lee Adventure? You can still get the chance to win a trip to Hongkong and Macau for four days and other exciting prizes as Schick Philippines extends its Smooth Lee Promo until November 30, 2014. The #SMOOTHLEEADVENTURE promo invites participants to create their own Schick television commercial using the Smooth Lee Adventure mobile application. 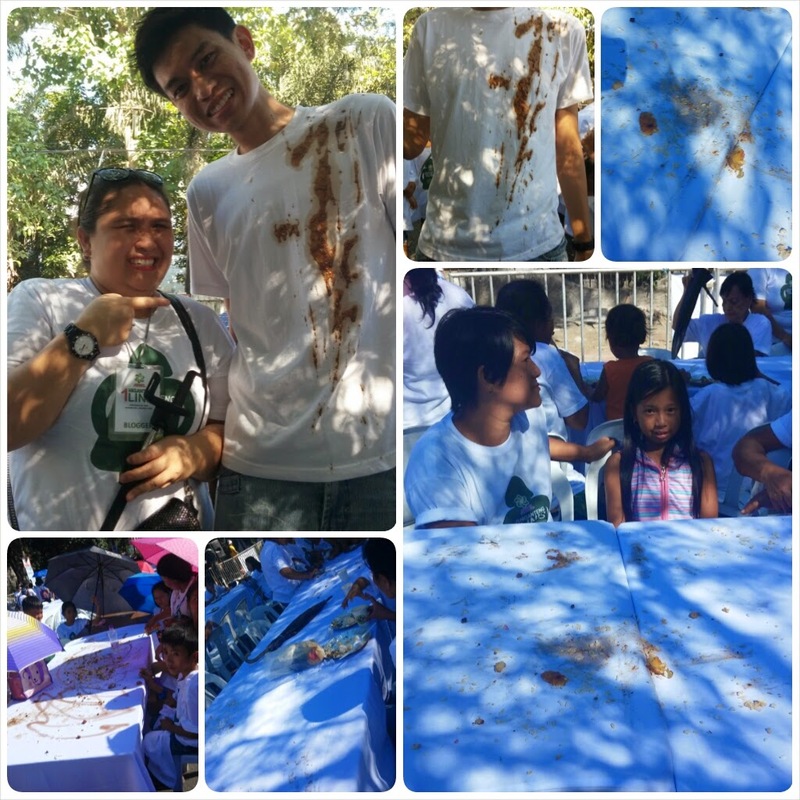 This kind of experience is what we want to make our Smooth Lee participants feel,” Claire Guevarra, Schick Senior Brand Manager said. The videos created will then be converted and downloaded to YouTube and the contestants will be prompted to “share” and/or “join” the promo. Those who opted to join the promo will have to register and submit their entries at the Schick website (www.schick.com.ph). From its original running date starting August 1 to September 30, 2014, the promo is now extended until November 30, 2014. “We are happy with the initial results of our Smooth Lee Promo, that is why, we wanted to extend it so that many will still have more chances of joining and winning,” said MJ Tiquia, Schick’s product manager. The Schick Smooth Lee Adventure is Extended! 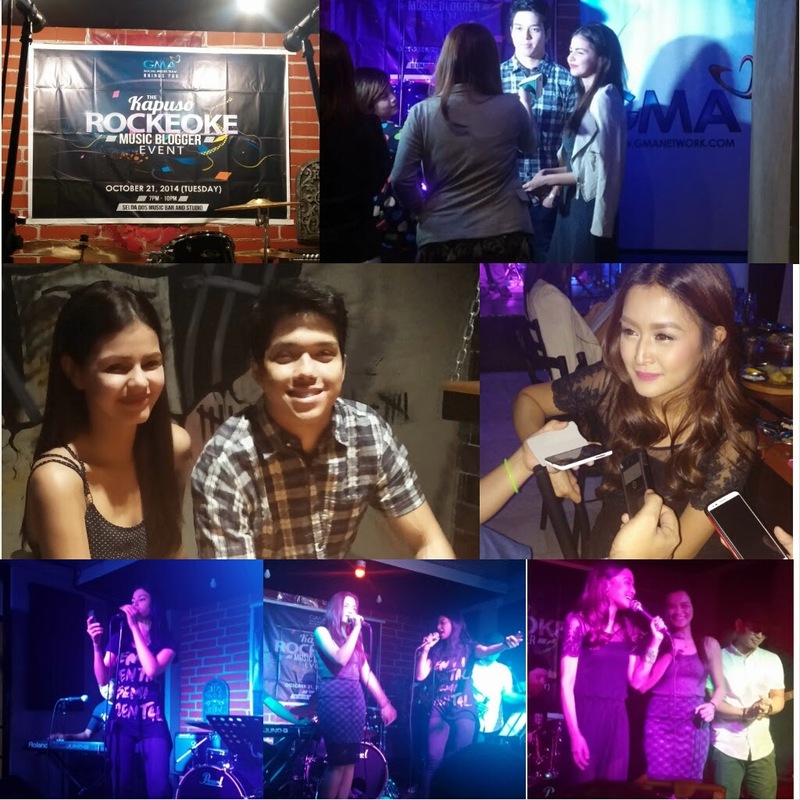 Kapuso Stars had a quick breaktime from their busy schedules during the Bloggers Rockeoke Night. 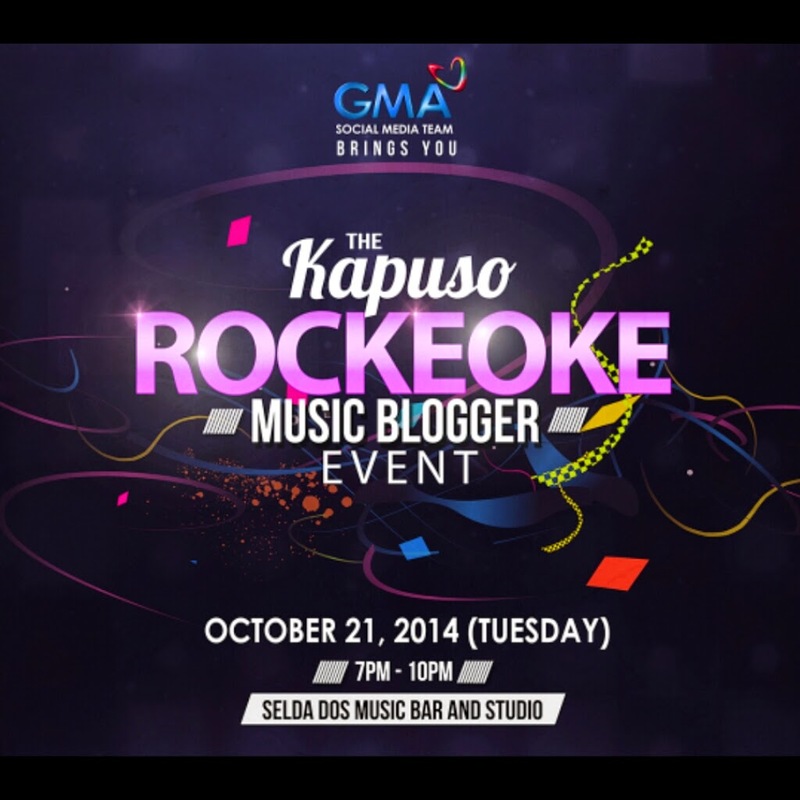 It was a great time jamming with some of our fave kapuso artists, food trip, some drinks and a lot of chit chats. Excited to know who is present during this awesome night? 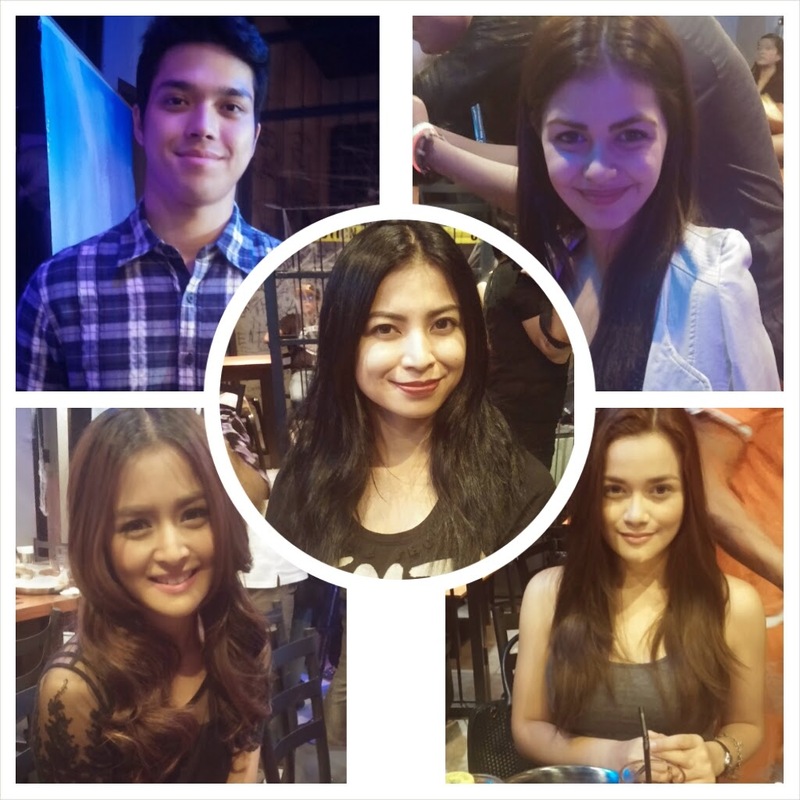 Here's the list: "More than Words" kilig love team Elmo Magalona and Janine Gutierrez, "Hiram na Alaala's" Kris Bernal, Ysmien Kurdi from "Yagit" and from the recent success of "Dading" is Glaiza De Castro. The artist were very excited to talk about their projects, coming this November is Elmo and Janine's "More than Words", they are currently recording the theme song of the teleserye and mind you it is an orginal piece, so congratulations in advance. Kris Bernal is also happy with ther current project "Hiram na Alaala" with the very handsome Dennis Trillo, asked about her love life? She currently has suitors but feels that it is not yet the right time and wanted to choose wisely this time because she hopes that whoever she will be with, is her forever. Yasmien Kurdi on the other hand enjoys her role as a mom in "Yagit" she said she can relate to it and easier for her to motivate herself since she's also a mom in real life, I love that she's so bubbly and still looked like the teenager from Star Struck. And what really amazed me that night is Glaiza De Castro, it is a Rockeoke night so of course singing was encouraged, and there she was, Glaiza belting out a song and I was like, this lady really has talent in singing, I know she sings but it is my first time to hear her live, hence the works on her upcoming album entitled "Synthesis" with all original tracks, she said she'll invite us once everything is done, and so is the suspense for you. It was a super relaxing night having a good time with these Kapuso Stars in their normal mode, laughing and sharing stories with them. Hopefully we'll have more events like this with other stars in the future. November marks the month when everyone starts planning for the Holidays. Plans, such as gift giving is one big part of the whole holiday treat. I've been in search of what new products, toys or groceries I could give out to family, friends and inaanaks. Luckily I found out about Healthy Options Christmas Boxes and got the chance to taste some of them and I thought to myself, healthy eating can be yummy too. 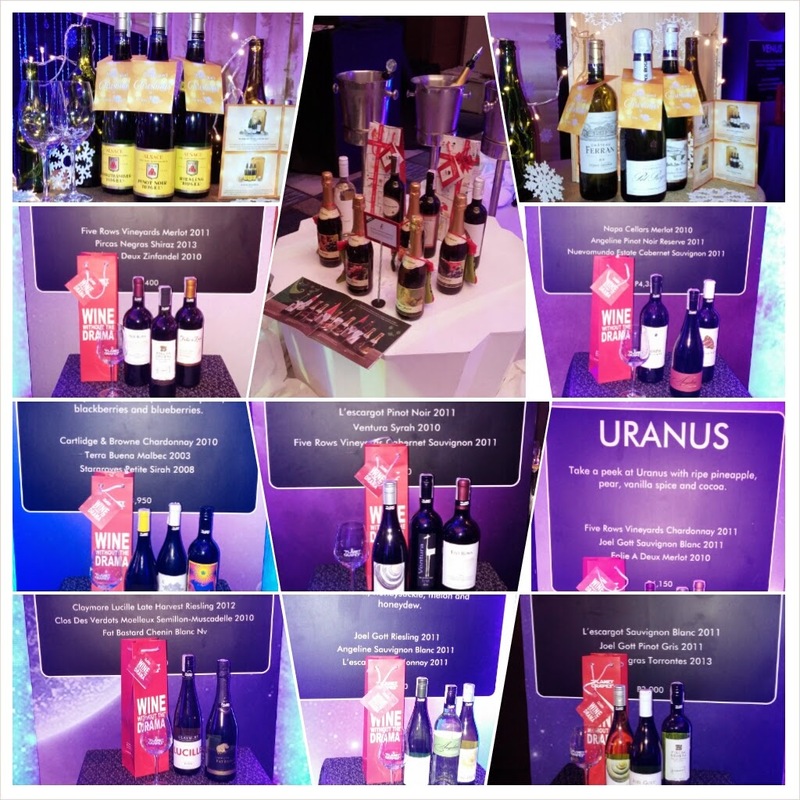 This year, Healthy Options together with Bow & Wow, Wine Story and Planet Grapes created beautiful and affordable packages that will be available starting this November. 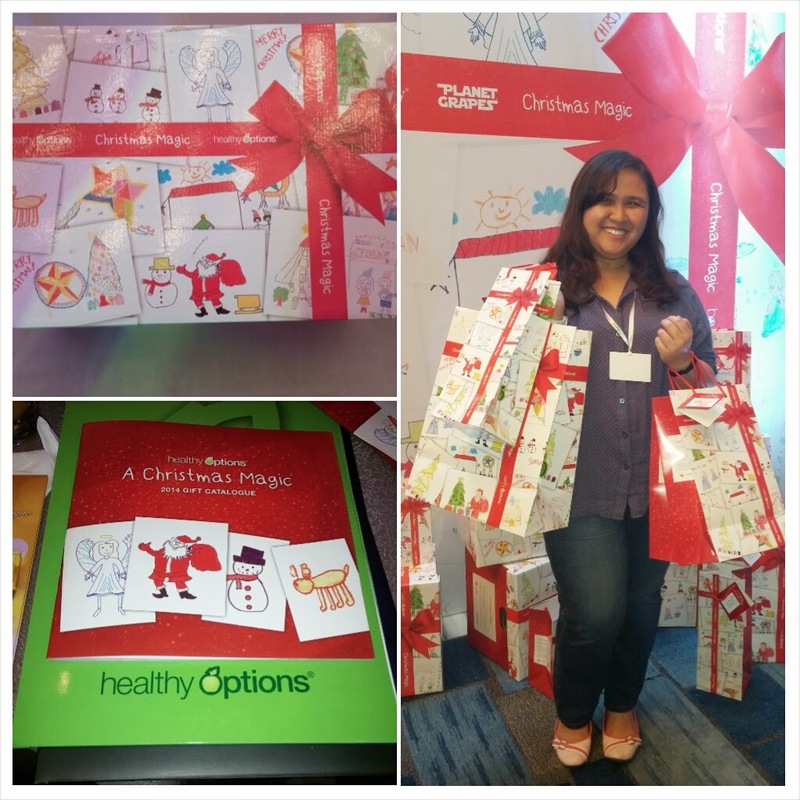 Healthy Options gift boxes and catalogues were printed with the drawings of Children with cancer from a foundation; super cute and unique. I am super excited to shop since the products are very flexible. Wines from Wine Story and Planet Grapes great for corporate gifts. Healthy Options for family, friends and kids. And of.course Bow & Wow for our lovely pets. Isn't that a good deal? 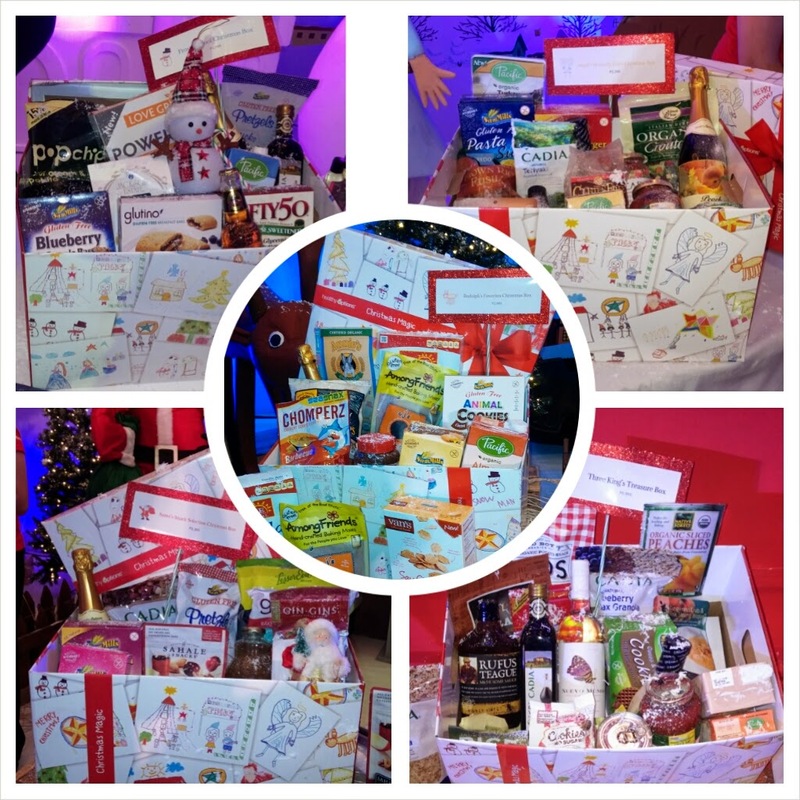 So for a healthier gift giving, visit Healthy Options now. The Healthy Options Christmas Boxes Are Now Here!